War of the Worlds: Frontlines is an anthology inspired by the classic HG Wells novel The War of the Worlds. For this collection, we asked for stories that revolved around aliens and human beings in conflict. As we put it, "...we realize that wars between man and alien could be fought on many fronts, and in many ways. Feel free to send stories that span time, space, and genres." What we have put together is a collection of stories that are touching, amazing, and horrific (sometimes all at once!). 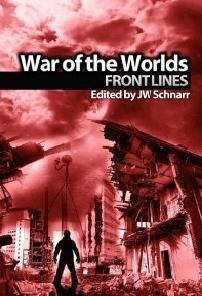 War of the Worlds: Frontlines contains 23 stories by some of the small press's more established authors, including 2010 Stoker nominated Edward Morris, Anthony, Darrel, and Pushcart finalist James S. Dorr, and Writers of the Future winner Brent Knowles (3rd quarter, 2009). Additionally, prolific horror writer Eric S. Brown, the "King of the Zombies" was graceful enough to write a forward for the anthology, as his mash-up novel War of the Worlds plus Blood, Guts, and Zombies (Coscom Entertainment) is out now! These words marked the beginning of H.G. Well's classic science fiction novel The War of the Worlds...and marked the end of man's child-like belief that we are alone in the universe. Published in 1898, The War of the Worlds is one of the greatest works of science fiction ever written, and it cemented H.G. Wells' legacy as a founding father of science fiction. A 1938 radio play by Orson Welles caused mass panic when it hit the airwaves, and frankly we haven't been able to trust aliens ever since. Michael Scott Bricker, Camilla Alexa, Vincent L. Scarsella, Sheila Crosby, Gerard Daniel Houarner, David Steffen, Mark Onspaugh, Bruce Golden, RJ Sevin, Kristen Lee Knapp, Harper Hull, Auston Habershaw, Brent Knowles, Michele Garber, Gary Cuba, Michael Penkas, JW Schnarr & John Sunseri, Mike Baretta, Edward Morris, Jodi Lee, Victorya, James S. Dorr, and Davin Ireland. Looking for great horror and science fiction? This title was added to our catalog on June 16, 2010.